Dubbed "GO! ", they are i10, i20 and i30 trims promising to add more appealing and unique design features to each, starting with their colors that resemble the French flag (blue, white and red) and ending with the lightweight alloy wheels. 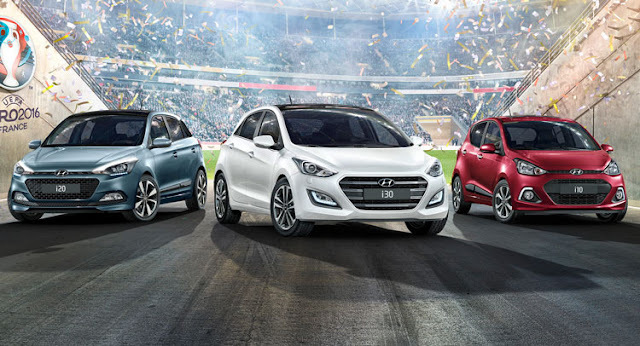 Hyundai states that the new i10 GO! benefits from a glossy black finish on the central console, blue stitching on the seats, steering wheel and gearshift lever and rear privacy glass. The special i20 GO! is offered with new design alloy wheels, blue and white stitching details, blue surrounds for the gearshift and outer air vents and black headlining to complete the picture. Setting apart the i30 GO! from regular versions are the new grille and 17-inch alloy wheels. Inside, it comes with metallic front-door scuff plates, black headlining and gunmetal finish on the steering wheel, center console, air vents and doors. Hyundai's new GO! editions are available for order in selected markets across Europe and they are accompanied by the "Real Deal for Real Fans" advertising campaigns. Prices and specifications vary by market.